Since late June 2007, Mars has been having a series of regional dust storms, which have obscured most of the planet--and the Mars rovers--with dust. 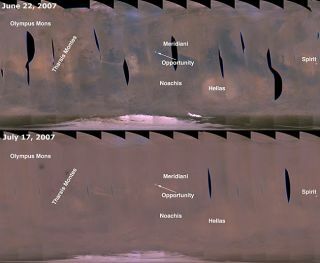 The Mars Reconnaissance Orbiter image from June 22, 2007 (top) shows the first in the series of storms. The July 17, 2007 image (bottom) shows a global "veil of dust" encircling the planet. A ragingdust storm on Mars has cut power to NASA's twin rovers to dangerously lowlevels, threatening an end to the mission. The roverswere slated to operate for only 3 months but have been on Mars more than 3years, so mission officials have had ample time to ponder theireventual silencing. The stormpresents perhaps the rover team's biggest challenge, NASA said in a statementtoday. Scientists said the storm, which has been brewing for nearly a month, isblocking around 85 to 90 percent of all sunlight to the surface. The rovers, Opportunity and Spirit, rely on sunlight to charge their solar panels, and oneor both rovers could be damaged permanently or evendisabled by the limited solar power, officials said. SPACE.com reported the storm's freshseverity earlier today. Scientistsfear the storms might continue for several days or weeks. If the sunlight isfurther slashed for an extended period, the rovers will not be able to generateenough power to keep warm and operate at all, even in a near-dormant state, thestatement said. The rovers use electric heaters to keepvital core electronics from becoming too cold. "We'rerooting for our rovers to survive these storms, but they were never designedfor conditions this intense," said Alan Stern, associate administrator ofNASA's Science Mission Directorate. SteveSquyres of Cornell University, who is the lead scientist of the MarsExploration Rover Project, said the direct sunlight to the rovers is at anall-time low. "Togive you a sense of the 'thickness'of the dust, the brightness of the sun as viewed from the surface is nowdown to less than 1 percent of what it would be with a perfectly transparentatmosphere," Squyres said. "Of course, Mars never has a perfectlytransparent atmosphere, but the sun is still very faint." The rovers'scientific operations were stopped Wednesday. "Thisis, I think, one of the most significant challenges we've faced over thisentire mission," Squyres told SPACE.com today. "The nature ofthe risk is well understood, but the magnitude of the risk is not. We simplydon't know what's going to happen next." Martian weatheris unpredictable, in part because there are few monitoring instruments andno formal weather forecasting agency as on Earth. "Whateverwe do, though, the problem is not going to get much better rapidly,"Squyres said. "I think that we have a good chance. If Mars really wants tokill these vehicles it can, but we have a lot of things working in ourfavor." If therovers expend too much energy, they may be unable to warm their electronics andprevent circuit-snapping temperatures. Before thedust storms began blocking sunlight last month, Opportunity's solar panels hadbeen producing about 700 watt hours of electricity per day, enough to light a100-watt bulb for seven hours. When dust reduced the panels' daily output toless than 400 watt hours, the rover team suspended driving and mostobservations, including use of the robotic arm, cameras and other site-inspectioninstruments. On Tuesday,July 17, the output from Opportunity's solar panels dropped to 148 watt hours,the lowest point for either rover. On Wednesday, the output dropped even lower,to 128 watt hours. MarkLemmon, a planetary scientist at Texas A&M University and member of therover team, said Opportunity is consuming 130 watt hours per martian day in its"sleep mode." If the negative balance continues without a break,Lemmon explained, the rover may malfunction in a matter of weeks. "Evenwith a 10-20 watt hour gap, we'd have a healthy rover for over a week,"Lemmon said in a telephone interview. "We've never been in situation wherewe've been in any imminent danger of a battery depleting, but it'spossible." NASAengineers are working to protect the rovers, especially Opportunity, which isexperiencing the brunt of thedust storm. The rovers are showing robust survival characteristics. Spirit,in a location where the storm is currently less severe, has been instructed toconserve battery power by limiting its activities. "Weare taking more aggressive action with both rovers than we needed before,"said John Callas, project manager for the twin rovers at NASA?s Jet PropulsionLaboratory. By Opportunity's 1,236th Martian day, which ended Tuesday, driving and all scienceobservations had already been suspended. The rover still used more energy thanits solar panels could generate on that day, drawing down its battery. "Theonly thing left to cut were some of the communication sessions," Callassaid. To minimizefurther the amount of energy Opportunity is using, mission controllers sentcommands on Wednesday, July 18, instructing the rover to refrain fromcommunicating with Earth on Thursday and Friday. This is the first time eitherof the rovers has been told to skip communications for a day or more in orderto conserve energy. Since theonset of the storms, engineers have said a similar storm could beweathered by NASA's next Mars mission, a robotic lander. Human missions toMars, a plan for the distant future, would be challengedgreatly by storms like this, officials say. Even ifeither of the rovers do malfunction, Lemmon explained all would not be lost. "Thisis a really good scientific opportunity to understand how dust storms on Marswork, how they dissipate and how the dust moves around inside them," hesaid. "I think we'll be able to use the information we're getting now tolook ahead to future mission to Mars." SPACE.com'sRobert Roy Britt contributed to this story.